This article was first posted at Washington’s Blog. The U.S. Air Force is complaining that it cannot find enough drone pilots. Of course, there are plenty of kids with the video gaming skills needed but, for one reason or another, they just won’t sign-up fast enough. The reasons might have to do with less promotional opportunities in the drone program but it could also be that many of these kids simply don’t want to engage in cowardly acts of long-distance killing. In any case, they need some convincing because the drone wars are just firing up. The military and corporate media have gone into overdrive in order to improve perceptions about the U.S. drone program and put drone attacks in a better light. And some of the verbiage suggests that it is not just general public opinion that is the target, but perhaps more importantly the opinion of potential drone pilot recruits. Drone pilots are redefined as “sensor operators” and the drone industry is campaigning to eliminate the word drone. 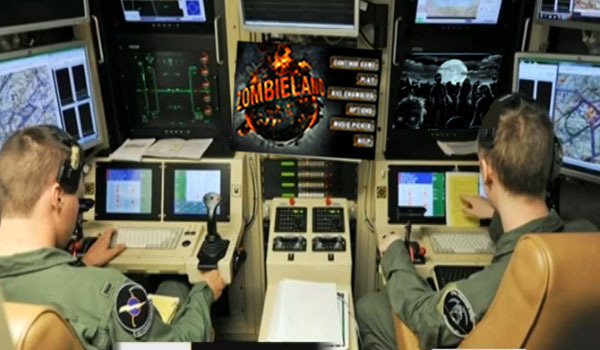 And the Air Force has turned to using video games, referred to as “militainment,” to recruit drone pilots. In early 2012, the Bureau of Investigative Journalism reported on the military’s use of a drone technique called the “double tap.” This is where a drone attack occurs and then, moments later, the first responders who arrive at the scene to rescue the victims are hit with another drone attack. There is evidence of 11 strikes on rescuers between 2009 and 2011 as well as a deliberate attack on a funeral causing mass casualties. The double tap technique continues to this day. Kids will quickly recognize the better-known use of the term double tap. It is one of the rules from the popular movie Zombieland, also made into a video game. The movie is based on the adventures of a young man as he navigates through a zombie apocalypse. He learns to rely on certain rules of survival and double tap—to shoot any zombie twice even if it looks dead—is one of the rules. Other rules include shoot first, enjoy the little things, and don’t be a hero, all of which apply to the prospective drone pilot. Killing zombies can be cool in a movie, and the kids who are recruited by the military these days know all about that. The drone attacks practiced by the U.S. military, however, are gruesome obliterations of actual human life and that is readily apparent to the families of the thousands of drone victims around the world. In the real-life scenario, the victims are not zombies. Instead, it is the drone pilot who must suppress all human emotion and thought about the victims. In other words, it’s the drone pilot who becomes a zombie. The CIA and the military, including the secretive Joint Special Operations Command, kill people with drones every day in the borderless and ill-defined War on Terror. Drone strikes occur regularly in countries like Afghanistan, Pakistan, Somalia, and Yemen. And the attempts to make these attacks sound cool or righteous are coupled with dehumanization of the victims. Preferably, the victims can be described as militants but, if not, the generic term combatants must serve. Since combatants are defined as any male of military age, in practice that means almost anybody. First responders and funeral participants are obviously not acceptable targets in any kind of war. But we need only vaguely hear that drone victims might have been “linked” to potential terrorists, or in the vicinity of potential terrorists. The U.S. Justice Department has concluded that government leaders can order the drone killing of anyone, even American citizens, if they are believed to be “senior operational leaders” of Al-Qaeda or “an associated force.” If all else fails, they are simply called Arabs. Of course, it is difficult to not hit an Arab in the countries where drones operate. The problem with de-humanizing the victims is that they are known to be real people living and struggling in their own land, being attacked by young foreigners playing video games seven to ten thousand miles away. For the political purposes behind the drone program, we need the victims to somehow become less human or more recognizable as fair targets in legitimate conflicts, and we need drone pilots to be seen as more heroic. To that end, we now have zombie reporters to tell us how our normal feelings of moral outrage about drone killings can be alleviated. An example of zombie reporting has recently been found in The Atlantic. Reporter Mark Bowden wrote an article telling us “How to think about drones.” Bowden explained that we are at war, and “the last thing you want is a fair fight.” He went on to explain how a drone pilot suffers anxiety and therefore, in so many words, should be considered a brave and indispensible soldier in the War on Terror. Yes, drone bombing civilians around the world certainly does seem like terror. But what Bowden appears to be arguing is that drone attacks are not really terror unless you can document that enough women, children, rescuers, and funeral participants have been killed. If so, we can safely count Bowden among the soul-less, walking dead. These attempts by media sources to make us feel better about drone attacks are absurd and imply that the target audience may have already suffered the kind of mental death attributed to zombies. Those of us who have not yet succumbed to propaganda-induced brain death realize that it is the military and the corporate media who have become non-human. We can see that the real zombies are not just the kids at the joysticks of death but we are witnessing zombie reporting too, employed to frame the attacks for zombie-like citizens. Forty years ago, Americans were outraged by the revelations of the CIA’s “family jewels”—crimes against democracy that the CIA was secretly perpetrating around the world. But many of those Americans are now gone and their descendants have quietly come to accept more state crimes than might ever have been imagined back then. Multiple wars of aggression, indefinite detention of suspects without charges, secret CIA torture sites around the world, and spying on all Americans are undeniable offenses of our government that have been agreed to by the corporate media and, by default, the public. Drone terror is just the next step. As these attempts at zombification of our society expand, more and more young people raised on violent video games will be recruited to engage in the long-distance killing of people around the world. Yet even the fact that tens of thousands of drones are being manufactured for use within the United States is unlikely to raise an alert with a public that has been carefully prepared for reports of drone killings and presidential “kill lists.” When drone terror begins to occur on U.S. soil, perhaps even double taps that kill first responders, will it result in any outcry or will our fellow citizens be sufficiently zombiefied by then? This September is the twelfth anniversary of the origin of the War on Terror. Perhaps it is finally time for the American public to re-animate the corpse of its political will, through enlightened self-interest, and call for a little critical thinking if not a moral uprising. You’ve outdone yourself. Thank you so much for this. P.S. You’re probably aware that our old friends at /Popular Mechanics/ recently devoted its cover to drones. The words “Good Drone, Bad Drone” appeared there. But I don’t find anything by that title at http://www.popularmechanics.com/search/?q=good+drone%2C+bad+drone. Quote: “P.S. You’re probably aware that our old friends at /Popular Mechanics/ recently devoted its cover to drones. The words “Good Drone, Bad Drone” appeared there. But I don’t find anything by that title at …”, the Popular Mechanics website. You’re using the PM website’s search engine. Using Google and ““Good Drone, Bad Drone” site:popularmechanics.com”, without the outermost quotes, I get a link for, “Drone Debrief: The Good, the Bad, and the Ugly in UAVs”, at PM. It’s a slide show. Doing a Google search of PM by separating “Good Drone” and “Bad Drone” to form two search terms or phrases turns up nothing, and all links returned for the search for “Good Drone, Bad Drone” seem to be for pages that refer, one way or another, to the page mentioned above. If that page is the one you’re referring to, then it’s a slide show and it seems that you should specify which slide or set of slides you intend to refer to. The first slide, f.e., surely isn’t among those you’d be intending. It’s about the “K-Max helicopter” and it apparently isn’t a drone used for attacking anything. But, there’re 9 slides about drones and maybe some of the others fit with what you have in mind. I fully agree, although I could add some stronger wording. Nonetheless, I agree with the gist of your article.